A mindset shift is an appropriate description for what’s required at a macro-level, across business, society, government, and the economy. The visual captures aspects of this shift, none more important than capability development in an Internet of Things world. Why? Because what that cell in the above matrix represents is a shift to ecosystem thinking. 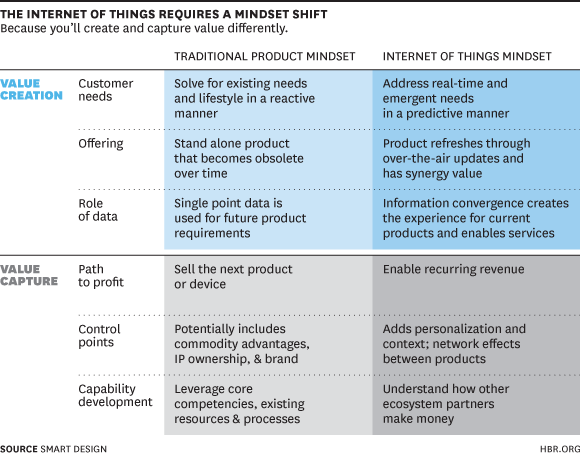 Although the context is the IoT, I’d argue that ecosystem thinking is a broader more comprehensive shift. Value creation and capture in the broadest sense is becoming a collaborative affair that increasingly involves multiple stakeholders within a value ecosystem. Managing in this world is more complex, requiring a collaborative competence that few companies have exhibited. The distributed nature of this emerging General Purpose Technology platform shifts us from a vertical orientation to a horizontal or lateral one. This shift disrupts traditional mindsets in a profound way, as companies move from a firm-level focus to an ecosystem focus. A recent article looks at this scenario from a Business Model Design perspective. The authors point to a shift in focus from technology platform to business ecosystems and the corresponding shift from the business model of the firm, to ecosystem business models. They define an ecosystem business model as a model composed of value pillars anchored in ecosystems and focused on both the firm’s method of creating and capturing value as well as those of any part of the ecosystem. Ecosystem thinking therefore requires a company to think both about their own monetization strategy, and how their value creation allows others to generate and collect value as well. Drivers for shared value are therefore explicit components, as we move to a value design paradigm. Is the Internet of Things an over-hyped innovation with modest impact – or a Third Industrial Revolution platform that drives the historical shift described by Jeremy Rifkin? No crystal ball here, but I feel very comfortable with this prediction: value ecosystems will be the new battleground and ecosystem thinking will determine winners and losers. The mindset shift MUST happen. For more insight into the possibilities of a Third Industrial Revolution platform, see my previous posts. Moving from Ego-System-Awareness to Eco-System-Awareness, and it’s not just in the business context but on a larger societal context. What is really holding us back, as collective society across boundaries, to move towards bringing eco-system-awareness to reality? Is the view of profit and monetarization pulling us back every time into old behavior that is so dysfunctional in times like these?